The United Nations World Health Organization (WHO) and its partners announced today they predict a major global increase in health consequences of emergencies this year due to El Niño. “To prevent unnecessary deaths and illnesses, governments must invest now in strengthening their preparedness and response efforts,” he highlighted. Based on the latest UN figures, the report estimates 60 million people will be impacted by El Niño this year with many suffering health consequences. Thus far, requests for financial support by seven high-risk countries – Ethiopia, Lesotho, Kenya, Papua New Guinea, Somalia, Tanzania and Uganda – have reached $76 million. WHO expects more countries will seek financial support to respond to El Niño effectively. Part of the response will be to provide additional health services to those in need, such as increased surveillance and emergency vaccination. Immediate needs also require funds to provide treatments for severely malnourished children in many countries, such as Ethiopia. 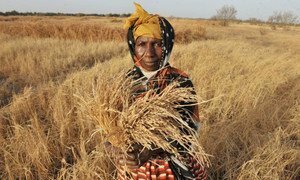 With 14 million people facing hunger in southern Africa as the El Niño weather pattern, the worst in over three decades, exacerbates drought, the United Nations World Food Programme (WFP) warned today that it faces critical funding challenges in scaling up food and cash-based aid.